Cost 45 million marks. Construction name "S". Markgraf, Kronprinz and Grosser Kurfürst. All Action times in CET.At 17:46 Scheer gave the Order for fire to be opened. König, Grosse Kurfürst and Markgraf were first to get into range and engaged Princess Royal and Tiger at 21,000 yards. König&apos;s secondary armament was aimed at the destroyers, Nestor and Nicator.All four torpedoes launched at König and Grosse Kurfürst missed. Nicator was hit in th engine room and with Nomad were sunk and their survivors picked up by German torpedo boats.18:00 shifted fire to Barham and then Valiant but they were able to move out of range. After 19:20, after Defence had been dealt with at close range by König (and Ostfreisland, Helgoland, Thüringen and Friedrich der Grosse) fire was switched to the Malaya which was involuntarily circling. Visual contact was quickly lost, König had to fight off an attack from British LCs and destroyers. At 19:30 she came under heavy fire from the deploying British battle line. Iron Duke fired 9 salvoes within 5 minutes landing 7 hits (Wki: "only one shell hit the ship"). Even though the shell exploded 50 yards behind the ship, Admiral Behncke was injured. During the 20:10 turn away, König was hit by Iron Duke just aft of the rear-most turret. It was a confusing picture as Vice Admiral Schmidt (commander of the I Battle Squadron) had decided to turn all at once rather than in succession. 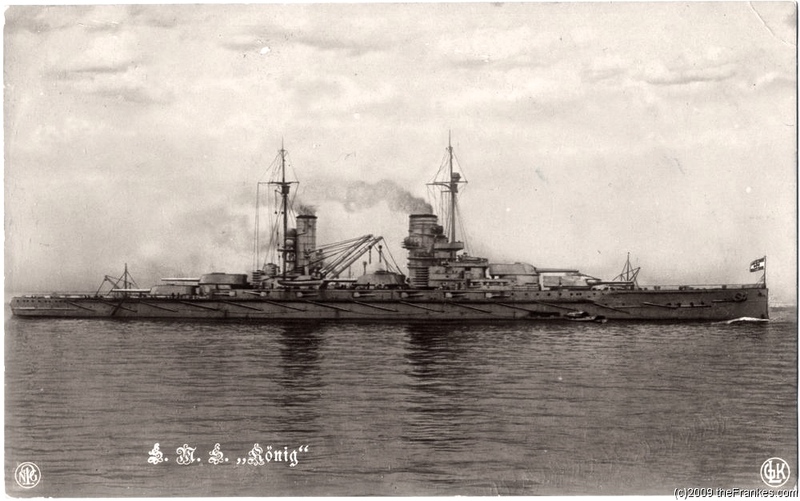 König turned to port and laid a smokescreen between her and her sister ships.König took on around 16,000 tons of water but was still able to maintain sped. She was not able to cross the Amrun channel however until the tide rose. 3 Parons steam turbines driving three shafts with three bladed props. Rated at 43,400 shp.